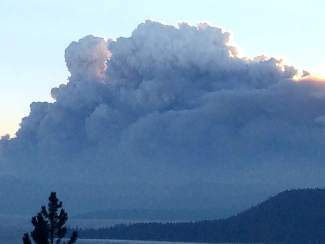 Large mushroom-like smoke clouds coming from the nearby King Fire could be seen during the summer of 2014 from beaches at Lake Tahoe. $1.094 million: to the U.S. Forest Service Lake Tahoe Basin Management Unit to reduce hazardous fuels on 2,300 acres of land between Crystal Bay and Incline Village and south to Spooner Summit and Zephyr Cove. $470,000: to the USFS to prepare a plan to remove hazardous fuels from urban lots it manages. $450,000: to the North Tahoe and Meeks Bay fire protection districts to reduce hazardous fuels on up to 514 acres of private and local government-owned land in Kings Beach, Tahoe Vista, Carnelian Bay, and Meeks Bay. $308,760: to the Tahoe Douglas Fire Protection District to reduce hazardous fuels on up to 100 acres of land around Kingsbury Grade communities. $290,490: to the Lake Valley Fire Protection District to reduce hazardous fuels on 93 acres of land in its service area. $261,940: to California State Parks to reduce hazardous fuels on 107 acres of land and restore and improve forest and watershed resources at D.L. Bliss State Park. $200,000: to the North Lake Tahoe Fire Protection District to reduce hazardous fuels on up to 544 acres of local government owned land in Incline Village. $120,500: to the state of Nevada to reduce hazardous fuels on approximately 70 acres of urban lots and open space in communities on the East Shore of Lake Tahoe. Source: Tahoe Fire and Fuels Team. Visit tahoefft.org to learn more. INCLINE VILLAGE, Nev. — More than $3 million to help reduce wildfire risk at Lake Tahoe was included in the latest round of the U.S. Bureau of Land Management’s Southern Nevada Public Land Management Act. 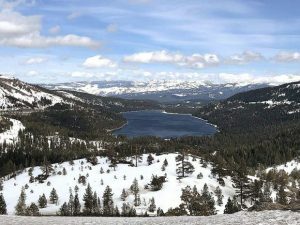 The funding is part of nearly $40 million going to projects around Nevada and California to reduce wildfire risk, conserve landscapes, restore wildlife habitat, and improve public recreation, said Tahoe Regional Planning Agency spokesman Tom Lotshaw. U.S. Secretary of the Interior Sally Jewell announced the funding awards earlier this month. “This funding represents an important investment in the Lake Tahoe Environmental Improvement Program, and will help protect our homes, businesses, and our recreation-based economy from devastating wildfire,” said North Lake Tahoe Fire Protection District Chief Mike Brown. Lake Tahoe fire districts and land management agencies are receiving the funding for projects to remove hazardous fuels from the Tahoe Basin’s extensive forested lands. 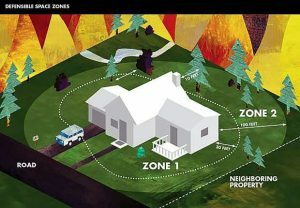 Projects will reduce wildfire risk for communities, watersheds, and natural resources, improve forest health, and educate people about Fire Adapted Communities and the need to create defensible space on their properties. Since becoming law in 1998, the act known as SNPLMA has raised money from public land sales in the Las Vegas Valley. Through the act, the Bureau of Land Management has provided $300 million in federal funding for projects at Lake Tahoe. The funding has paid for water quality projects, bike paths, habitat restoration, hazardous fuels reduction, aquatic invasive species prevention, public recreation enhancements, planning, and scientific research.